Last night Legends of Fire, at Northern Quest Casio, had a John Starks Cigar event. 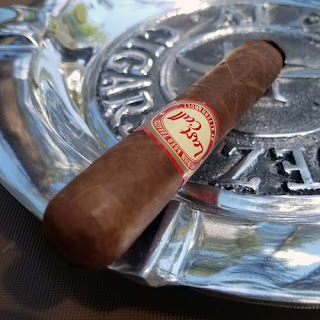 Every one in attendance received two of John's great cigars, one Connecticut, one Maduro and a tasty sample of Pyrat Rum. There were several drawings and if you purchased a box, John would sign it. I picked up a second ticket and the wife went along. She had a great time as well! So now that you know the story, lets get on to the cigar. 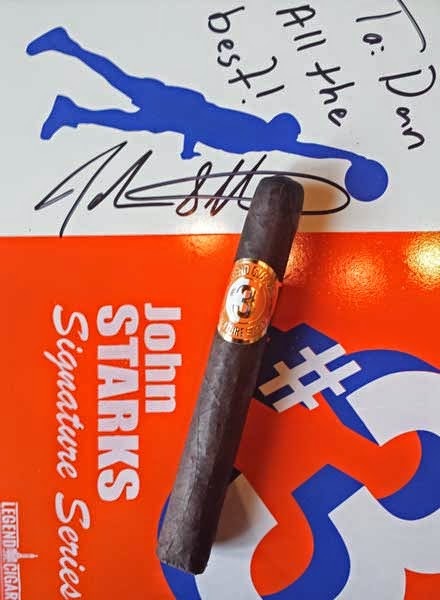 My first cigar was the John Starks #3 Signature Series Maduro Cigar from Legends Cigars. This toro was covered by a hearty, nearly oscuro colored Brazilian Maduro wrapper. It was oily, seamless, virtually vein free and packed well full lenght. Bottom line, it was a great looking cigar. From the cold foot and the free draw there were flavorful notes of cocoa and cream--it reminded me of hot cocoa. Once the foot was toasted and burning it produced a large volume of mild/medium bodied smoke. I'll tell you about the flavors, but this cigar was a chocolate bomb. If found nuances of cocoa, cream, milk chocolate, leather, earth and cream. As the sixty minute burn came to a conclusion, the cigar finish with a delicious medium bodied mix of charcoal, cream and cocoa (burnt mocha). Overall I thought this was a fantastic cigar. It was smooth, it had a tasty flavor mix and great burn. Don't pass this cigar up, it's a winner.